« How long after using Roundup can I plant? In most gardens you might see in your area it is very doubtful any of them will be laid out with mulch between the plants. Most likely you will see widely spaced rows of vegetables designed most likely to accommodate a roto-tiller between the rows. This rather old fashioned approach to gardening began with the advent of the horse drawn plow used in farming over a century ago. The rows had to be wide enough that the horse (or later the tractor tires) could fit between the rows of vegetables. Jane and I are both intimately acquainted with this equipment having grown up on farms, and having farmers for ancestors. It was simply accepted practice that this is the way you do it. And it spilled over into the garden, probably because some wise farmer would use the same equipment to till his garden as well as his fields. This may be acceptable for large acreages, but it does not hold true for your garden. There is a better way. We took our cue from nature many years ago when we asked ourselves how the trees of our forest grow so well, and all of the bushes and berries that surround them produce bountiful crops without someone tending the soil as though it were a farm. The answer, none too surprisingly was laying on the ground in the form of leaves that act as a mulch suppressing the smaller growth and allowing the stronger plants to flourish. Why not replicate this natural system, which seems to do so well in our own garden and test the results… and what results we got. Stronger plants, more drought resistant, more pest resistant, better soil and a number of other benefits all resulted from our early testing. It simply works, so we made a change in our garden and started using mulch everywhere. No more tilling between the rows, so the plants could be closer together since there was no need to fit the rototiller there either. In fact, the rototiller now sits gathering dust in the shed, one more piece of equipment you just don’t need. Suddenly our garden was transformed into a place that replicated the natural world and provided for our family in a way that it never did before. In many ways trying to solve a problem like weeds between the rows in conventional farming lead to so many other problems, from equipment maintenance, to inefficient land usage and even pest outbreaks from this familiar monoculture method. The world around us is founded upon the concept of diversity, and when we seek to reproduce those conditions we are rewarded, and justifiably so. It was funny how one decision helped all of these other benefits to fall into place. Since the soil is covered it retains water better, and the plants grow better. 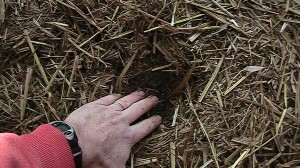 Pull back the straw and you will see teaming life under there, with the soil being fed by the mulch, which in turn feeds the plants, a wonder cycle of life. In the end it was just too efficient, used the space so effectively, cut down on our work load and reduced the equipment used not to adopt it in our entire garden. It just works, give it a try. Now, you can enjoy all the benefits of fresh food for many months of the year, without all that digging and weeding! Learn to grow your own super fresh produce, take some of the strain off of your grocery budget and enjoy quiet time in your garden! Try Gardening Secrets today and get better results from your garden with less work! Learn more here. 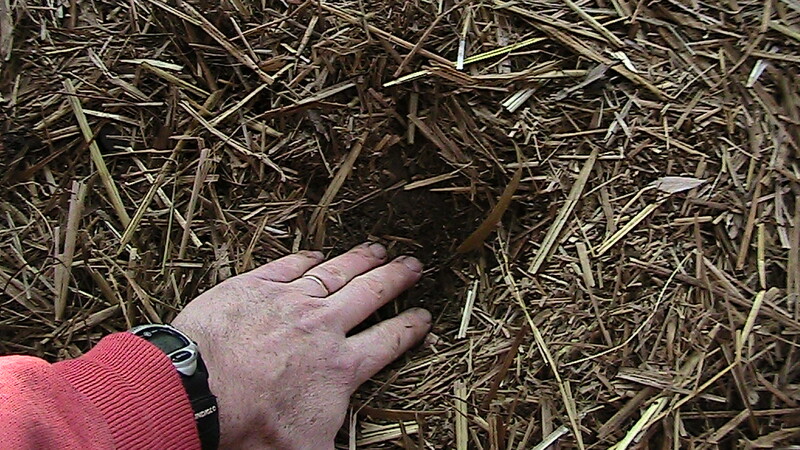 I mulch everywhere in my garden – never leave bare soil. The only mulch I use is chopped up weeds which are of course free.